For the first time in over 50 years, the Knox translation of the Bible is being reprinted through Baronius Press. But, what is the Knox Bible? 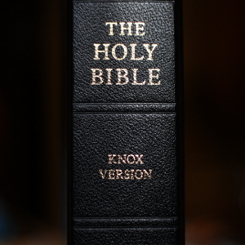 The Knox Bible is an approved Catholic translation whose aim is to produce a translation of the Bible which reads in a fluid and eloquent English. 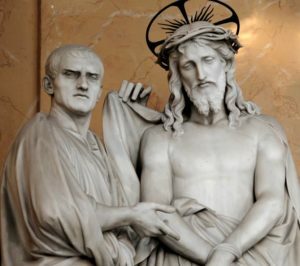 This nine-year effort was undertaken solely by Monsignor Ronald Knox, an Anglican-turned-Catholic-priest, at the request of the Bishops of England and Wales prior to World War II. Motivating the project was a desire to replace the Douay-Rheims Bible. Although the Douay-Rheims had been a Catholic staple since the reformation, many felt the archaic language made the translation difficult to understand in a number of passages. The result of Msgr. Knox’s efforts was a translation that received wide praise and was approved for liturgical use in many English-speaking areas in the decade preceeding Vatican II. Even Venerable Archbishop Fulton Sheen preferred the Knox Bible, often using it as a reference when quoting verses. And this was the manner of Christ’s birth. 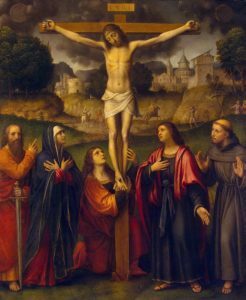 His mother Mary was espoused to Joseph, but they had not yet come together, when she was found to be with child, by the power of the Holy Ghost. Whereupon her husband Joseph (for he was a right-minded man, and would not have her put to open shame) was for sending her away in secret. But hardly had this thought come to his mind, when an angel of the Lord appeared to him in a dream, and said, Joseph, son of David, do not be afraid to take thy wife Mary to thyself, for it is by the power of the Holy Ghost that she has conceived this child; and she will bear a son, whom thou shalt call Jesus, for he is to save his people from their sins. 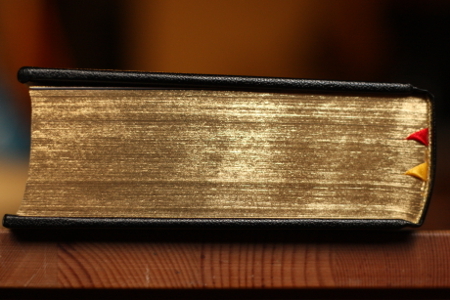 One interesting feature of the Knox Bible is its attention to detail with some of the psalms. In the original Hebrew, some psalms take the form of an alphabetical acrostic – the first letter of each verse is ordered such that they read from the beginning to the end of the Hebrew alphabet. This is believed to indicate a completeness in thought, similar to the idea that Christ is the alpha and the omega. When translating into English (or any other language), this quality is lost. However, Msgr. Knox took good care with these alphabetical acrostics, providing translations which maintain this ordering in a beautiful English rendering. For example, go check out Proverbs 31:10-31, which helpfully bolds the first letter of each verse. On the practical side of things, if you’re familiar with Baronius Press, you know their products are top quality – leather bound, gold gilding on the pages, and two ribbons to help you keep your place. 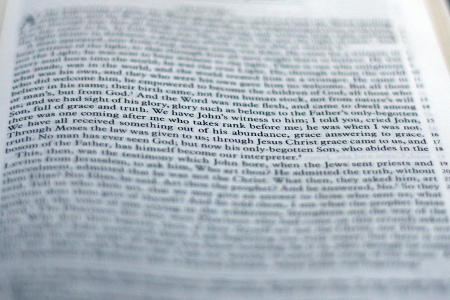 You will find the page layout of the Knox Bible to be a little different compared to many other Bibles. 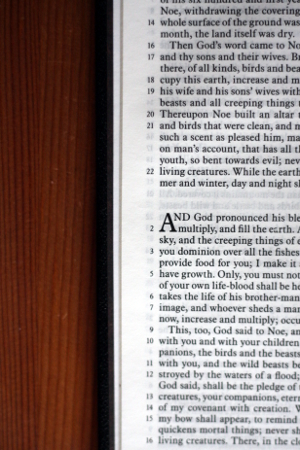 Rather than two columns on a page, the Knox translation favors a single column style. Additionally, verse numbering is done in the margins of the page, rather than inline. Both of these features make for a more readable layout of the Bible. As a bonus, when you order the Knox translation from Baronius Press, you receive a short booklet written by Msgr. Knox entitled “On Englishing the Bible”. This booklet gives Msgr. Knox’s account of translating the Bible from the Latin Vulgate, the challenges of finding an accurate – but readable – phrasing, and a healthy dose of Monsignor’s wit. Unsure about whether to take the plunge with the Knox translation? You can read through it on Bible Gateway! Already convinced? You can purchase a copy of the Knox Bible from Baronius Press. 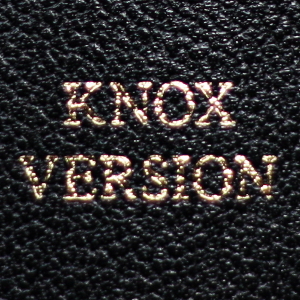 Have you used the Knox Bible before? If so, what are your impressions? 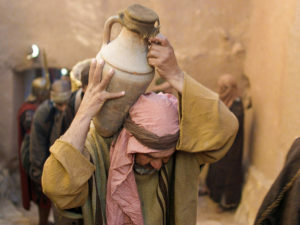 If not, what Bible translation do you prefer, and why? Allie Terrell is a 2010 convert to Catholicism after dabbling in a few different trains of religious thought. She graduated from Rose-Hulman in 2009 with a degree in computer science, and is now pursuing her doctorate in the hopes of teaching some day. When she can spare a few hours, Allie likes to visit religious sites and work on her photography. She blogs about her journeys at Here Is The Church. Thank you for the post. I’m a Spanish speaking person, and some times need an English version and had no clue which ones are around. This post gave me new lights. Blessings! I use two copies of the Knox bible, a pocket edition when travelling and a full-size one; both date from the 1950s. The Knox version is excellent as a translation of the Vulgate Latin as well as an English text in its own right; it is written in an elevated, hieratic style which is fitting for Holy Scripture. As you remarked, the production values of Baronius’ books are invariably excellent. This re-publication is very good news indeed. I LOVE the Knox translation. Thanks for the heads up! Just received my Knox Bible two weeks ago. I love it. I appreciated his book,’Enthusiasm’ as a guide for understanding the Charismatic Renewal. I found a Knox Bible in a second hand store by accident and now use it to clarify interesting passages of the bible. Thanks!This is great.I love old english!